Get updates on new activities! Scroll or click . . . 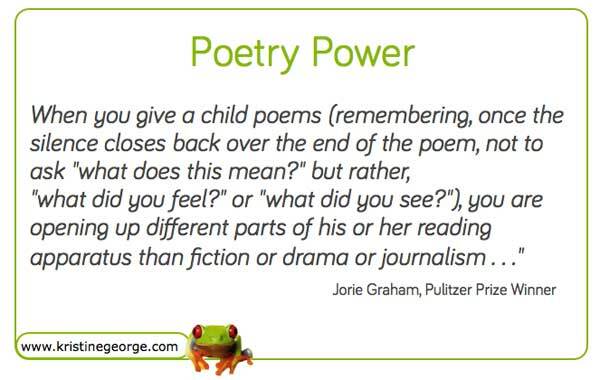 Using my poetry collections in your classroom? Click on slides below. Searching for a specific poem? * The word, 'with,' was deliberately chosen. When adults write along with young writers they send a powerful message: We are all writers with the same joys and frustrations. Inspiration for poems can come from anywhere, including works of art. Writing poetry in response to art is both challenging and exciting. I was asked to submit poetry for two anthologies — one in which I chose the art (Heart to Heart: New Poems Inspired by Twentieth-Century American Art) and one in which the art was assigned (Hoofbeats, Claws & Rippled Fins: Creature Poems). I enjoyed both approaches. Although, Hoofbeats, Claws & Rippled Fins: Creature Poems is out of print, copies are available at the library or Alibris. 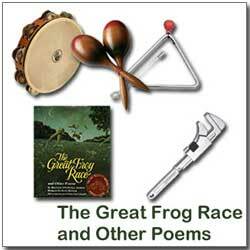 Visit Stephen Alcorn's site for a look at the frog Lee Bennett Hopkins assigned as my subject: Use these fine anthologies as a starting point to help students discover how different poets responded to self-selected or assigned works of art. Then, use art posters, slides, art books, or even a trip to a local art museum as the foundation for a poetry writing exercise. I hope your students have as much fun exploring "Art as Muse" as I did. Children (and adults!) often have difficulty writing about topics in the abstract. Sometimes intriguing show and tells—such as 'Mr. T.'—a caged pet tarantula will spark young writers. The students' tarantula poems—written from direct observation—were fresh and engaging. by Joy Acey, a talented poet and teacher in North Carolina. Thanks, Joy! Sometimes you need a quick way for the members of a group to get to know each other. Writing an acrostic poem is a great way to do this. I like using paper bags for this exercise. An acrostic poem forms a word vertically from horizontal lines. (Doesn’t that sound confusing?) Just have each person write their name vertically down the bag and then use one letter to start the word for their line of poetry. See how the letters reading down spell my name JOY? You can use single words or whole phrases. When everyone is done line the bags up on a table or along the wall so people can walk by to read the poems. "I teach third grade, and we have begun a Poetry Party. 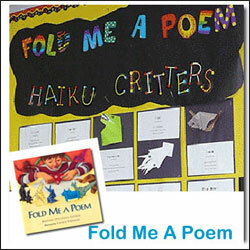 During the week the children either look through poetry books, or search the Poetry Box for a poem to bring on Friday. One student each week is the "host" of the party and provides a nutritious snack to have after the students have all had a chance to either read or recite the poem they have chosen. Some of the students even write their own poem to share with the class. I have found that this has been a wonderful way to end the week!" "Give the gift of poetry. A love of poetry can last a lifetime! 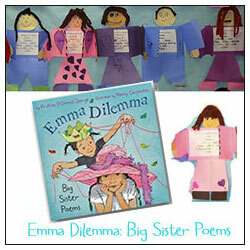 Have students consider creating poetry magnets, bookmarks, and postcards as the gift giving season draws near. Find or create poems with special meanings for the person who will receive it. A love of poetry can be contagious.... so help to spread it!" "I just finishing doing a Beach Poem Party at my school with another teacher. I teach 2nd and she teaches first. We had the children write acrostic, rhyming and free verse. We invited our parents with beach towels, decorations of the beach and had lemonade and pecan sandies for a treat. Each read their poem using a microphone. Then the poems were bound and given to the parents to keep from the poem party. This was a wonderful experience and I will try it again next year with maybe a few more teachers. This is really the first time I have made poetry such a big part of my curriculum. Thanks for letting me share. I am looking forward to sharing your books." "I had to write again to share an idea for teaching poetry to small children (3-5 age range): since kids naturally love strong rhythms and fun rhyme, I am putting together "Rhythm and Rhyme" - a public library program (I am employed in the Johnson Co. Pub. Lib. System). My basic idea is to use a large area (outdoors or a conference room), lots of old paper towel tubes and various other noise makers, and our bodies. I will read strongly rhythmic rhymes/poems and the kids and I will march/jump/skip/beat - according to particular poem's "feel"! It will be noisy fun, and should, I hope, instill the fun and music of language in the kids. I know this isn't anything "new", but it will be to myself and the area's kids. We'll have a good time!" 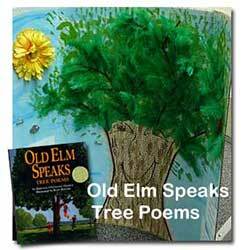 First Attempt at Poetry from Two Writing Teachers blog An engaging look at a talented teacher as she guides her Kindergarten students towards discovering the joys of language and poetry. Poet's Paradise: A Collection of Helpful Resources Thanks, Michelle, for sharing this terrific resource! Explore haiku at The Haiku Society of America. 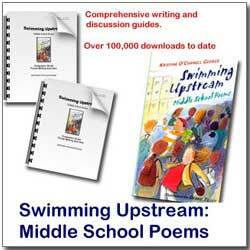 Harris Middle School in Tennessee has a terrific poetry resource site with sequential lesson plans that can be enjoyed by students and teachers alike. Check it out! Introducing poetry to children is a delightful essay by Charlotte Mason with some very wise suggestions. I particularly enjoyed: "With Tact and a Tiny Bit of Enthusiasm." Poetry Power on Planet Esmé includes a delicious essay on poetry, activities, and recommended books. "Poetry Starters" from Kathi Appelt will "prime the pump" and get you started writing! Plus...Potato Hill Poetry is great resource. Poetry 180 - A Poem a Day for High Schools is Billy Collins' first project as Poet Laureate. Check it out then click here to read the selected poems. Enhancing a Poetry Unit with American Memory focuses on using "found poetry" from the Library of Congress databases of memoirs collected for the Federal Writers' Project by the Works Progress Administration. 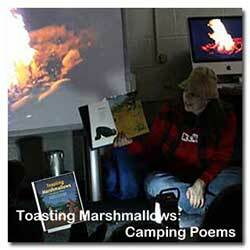 Web English Teacher maintains a comprehensive site with links to individual poets and poetry-related lesson plans. Jim Zola's wonderful article on poetry. The links below feature poetry by young authors or offer invaluable writing advice. NewPages.com has a wealth of resources for young writers. Poetry Alive! publishes one student poem per month. Check out the poems! 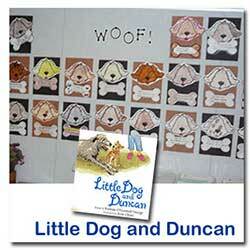 Other resources that will be helpful if you are interested in publishing for children.